You can encrypt connections for source and target endpoints by using Secure Sockets Layer (SSL). To do so, you can use the AWS DMS Management Console or AWS DMS API to assign a certificate to an endpoint. You can also use the AWS DMS console to manage your certificates. Not all databases use SSL in the same way. Amazon Aurora with MySQL compatibility uses the server name, the endpoint of the primary instance in the cluster, as the endpoint for SSL. An Amazon Redshift endpoint already uses an SSL connection and does not require an SSL connection set up by AWS DMS. An Oracle endpoint requires additional steps; for more information, see SSL Support for an Oracle Endpoint. To assign a certificate to an endpoint, you provide the root certificate or the chain of intermediate CA certificates leading up to the root (as a certificate bundle), that was used to sign the server SSL certificate that is deployed on your endpoint. Certificates are accepted as PEM formatted X509 files, only. When you import a certificate, you receive an Amazon Resource Name (ARN) that you can use to specify that certificate for an endpoint. If you use Amazon RDS, you can download the root CA and certificate bundle provided by Amazon RDS at https://s3.amazonaws.com/rds-downloads/rds-combined-ca-bundle.pem. You can choose from several SSL modes to use for your SSL certificate verification. none – The connection is not encrypted. This option is not secure, but requires less overhead. require – The connection is encrypted using SSL (TLS) but no CA verification is made. This option is more secure, and requires more overhead. verify-ca – The connection is encrypted. This option is more secure, and requires more overhead. This option verifies the server certificate. verify-full – The connection is encrypted. This option is more secure, and requires more overhead. This option verifies the server certificate and verifies that the server hostname matches the hostname attribute for the certificate. Not all SSL modes work with all database endpoints. The following table shows which SSL modes are supported for each database engine. SSL connections to Amazon Redshift target endpoints are not supported. AWS DMS uses an Amazon S3 bucket to transfer data to the Redshift database. This transmission is encrypted by Amazon Redshift by default. SQL timeouts can occur when performing CDC tasks with SSL-enabled Oracle endpoints. If you have this issue, where CDC counters don't reflect the expected numbers, set the MinimumTransactionSize parameter from the ChangeProcessingTuning section of task settings to a lower value, starting with a value as low as 100. For more information about the MinimumTransactionSize parameter, see Change Processing Tuning Settings. Certificates can only be imported in the .PEM and .SSO (Oracle wallet) formats. If your server SSL certificate is signed by an intermediate CA, make sure the entire certificate chain leading from the intermediate CA up to the root CA is imported as a single .PEM file. If you are using self-signed certificates on your server, choose require as your SSL mode. The require SSL mode implicitly trusts the server’s SSL certificate and will not try to validate that the certificate was signed by a CA. You can use the DMS console to view and manage your SSL certificates. You can also import your certificates using the DMS console. You can add an SSL connection to a newly created endpoint or to an existing endpoint. Sign in to the AWS Management Console and choose AWS Database Migration Service. If you are signed in as an AWS Identity and Access Management (IAM) user, you must have the appropriate permissions to access AWS DMS. For more information on the permissions required for database migration, see IAM Permissions Needed to Use AWS DMS. In the navigation pane, choose Certificates. Upload the certificate you want to use for encrypting the connection to an endpoint. 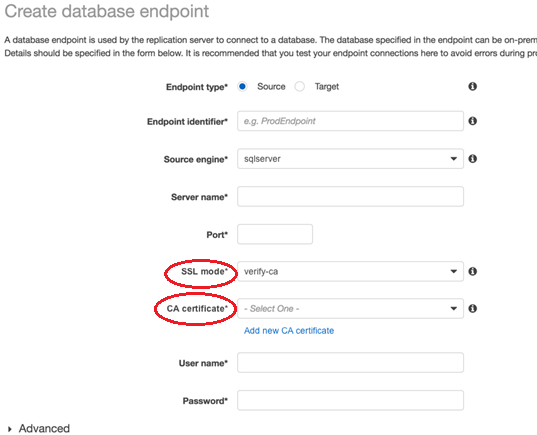 You can also upload a certificate using the AWS DMS console when you create or modify an endpoint by selecting Add new CA certificate on the Create database endpoint page. In the navigation pane, choose Endpoints, select the endpoint you want to modify, and choose Modify. If you select either the verify-ca or verify-full mode, you must specify the CA certificate that you want to use, as shown following. When the endpoint has been modified, select the endpoint and choose Test connection to determine if the SSL connection is working. After you create your source and target endpoints, create a task that uses these endpoints. For more information on creating a task, see Step 4: Create a Task. Oracle endpoints in AWS DMS support none and verify-ca SSL modes. To use SSL with an Oracle endpoint, you must upload the Oracle wallet for the endpoint instead of .pem certificate files. To use an existing Oracle client installation to create the Oracle wallet file from the CA certificate file, do the following steps. Append $ORACLE_HOME/lib to the LD_LIBRARY_PATH system variable. Put the CA certificate .pem file in the ssl_wallet directory. Amazon RDS customers can download the RDS CA certificates file from https://s3.amazonaws.com/rds-downloads/rds-ca-2015-root.pem. When you have completed the steps previous, you can import the wallet file with the ImportCertificate API by specifying the certificate-wallet parameter. You can then use the imported wallet certificate when you select verify-ca as the SSL mode when creating or modifying your Oracle endpoint. Oracle wallets are binary files. AWS DMS accepts these files as-is. To use a self-signed certificate for Oracle SSL, do the following. Create a directory you will use to work with the self-signed certificate. Change into the directory you created in the previous step. Self sign a root certificate using the root key you created in the previous step. Create an Oracle wallet directory for the Oracle database. Create a new Oracle wallet. Add the root certificate to the Oracle wallet. List the contents of the Oracle wallet. The list should include the root certificate. Generate the Certificate Signing Request (CSR) using the ORAPKI utility. Put 'dms' as the common name. If the output from step 12 is sha256WithRSAEncryption, then run the following code. If the output from step 12 is md5WithRSAEncryption, then run the following code. Add the certificate to the wallet. Configure the sqlnet.ora file ($ORACLE_HOME/network/admin/sqlnet.ora). Add entries for SSL in the listener.ora file (($ORACLE_HOME/network/admin/listener.ora). Configure the tnsnames.ora file ($ORACLE_HOME/network/admin/tnsnames.ora). Show the Oracle listener status. Test the SSL connection to the database from localhost using sqlplus and the SSL tnsnames entry. Verify that you successfully connected using SSL. Change directory to the directory with the self-signed certificate. Create a new client Oracle wallet for AWS DMS to use. Add the self-signed root certificate to the Oracle wallet. List the contents of the Oracle wallet for AWS DMS to use. The list should include the self-signed root certificate. Upload the Oracle wallet that you just created to AWS DMS.